Berlin (VNA) – Minister of Planning and Investment Nguyen Chi Dung is looking at scientific research, technological innovation and personnel training in leading German corporations during his ongoing Germany visit at the invitation of German Federal Minister for Economic Affairs and Energy Peter Altmaier. Minister Dung expressed his wish that Siemens, SAP and Fraunhofer would invest more in Vietnam by building solar panels and wind turbine plants to meet energy demand in Vietnam and ASEAN, building new research and lab centres in Hoa Lac Hi-tech park. 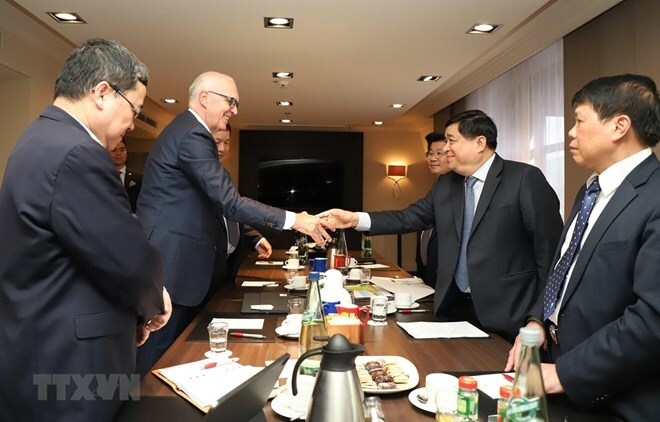 Leaders of Siemens, SAP and Fraunhofer expressed their special interest in the Vietnamese market, saying that they have taken specific steps to boost technological cooperation between the two nations. They spoke highly of the formation of the Vietnam National Innovation Centre, considering it a model to attract capital and brainpower from leading partners, including German companies. Siemens is Germany’s leading multidisciplinary group, focusing on industry and high technology. After over 70 years of development, Siemens is now present in over 190 countries, employs about 380,000 workers and generates over 90.8 billion USD in revenue. It also leads others globally in gas turbine field. Meanwhile, the 47-year-old SAP has become the biggest software maker in Europe and the fourth largest in the world. In Vietnam, it has assisted enterprises in finance, banking and aviation.